The one where I get engaged. You read that correctly: ENGAGED. So Man Piece and I have officially being seeing each other for a year. On that one year anniversary, he decided to pop the question. Quite a surprise, I will tell you! 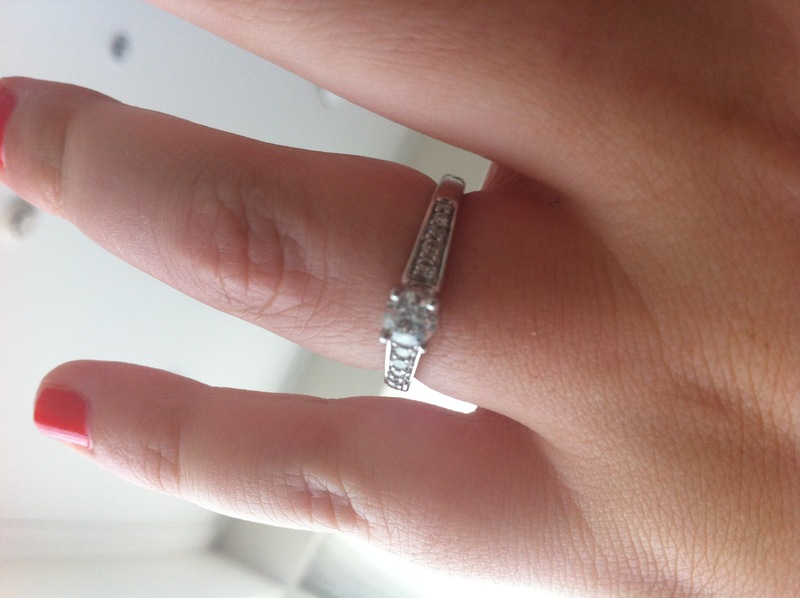 Everyone has been asking for the story of how he proposed, so to save me time, I’m blogging it. ‘Cause, yanno, that’s what I do. At the weekend we were in Wellington. Man Piece had managed to get grabaseats for both of us over Auckland Anniversary, which was quite awesome. He even booked us in at The Bolton Hotel. Flaaaaaash. We had just been out for dinner on Sunday and had wandered back to the hotel. I was fairly exhausted as I woke up Saturday with a cold which has really sucked all the energy out of me. I had collapsed on the bed, about ready to fall asleep and Man Piece was lying next to me. We were talking about things that had happened throughout the year – lots of lovey, vomit worthy stuff. The whole, “You make me feel like a better person.” “I don’t want to be without you.” “I love you.” etc etc. I noticed his heart was beating quite fast at one point, almost beating out of his chest. I was in shock. Like, WUT. Then I wanted to try on the sparkles. After that I was like, “I guess that’s a yes.” Smooth, real smooth. But the most important thing is that I said yes and I get to be with the man that makes me feel special for the rest of my life. So now I’m engaged. I’m the future Mrs Carr. WUT. And I have a wedding to plan. We’re thinking around February 2013. I want a summer wedding and to get married before my bridesmaids flee the country. ← Best and worst dressed. boy… that was so romantic. Remeber the cane and top hat! Youve got our best wishes here Lisa. I think you know that.